Halloween came in a box when I was growing up. Or at least, most of my Halloween costumes did. The moment the first leaf rusted on the branch, I’d beg my parents to take me to K-Mart, Bradlees, or Zayre so I could pick though the stacks of boxed Halloween costumes. This was very important business for a kid, after all, I needed to select something representative of my persona which could stand out among the sidewalk masses on Halloween night. No easy task considering that all of the other neighborhood kids were also dragging their parents to the same discount department stores and rifling through the same stacks of boxed costumes. No matter what I chose, I was bound to meet my costume doppelgänger on some front porch. This didn’t faze me though. We’d both know who was wearing it best. The costume selections that got my attention (and eventually my parent’s money) were produced by two rival companies, Ben Cooper, Inc., and Collegeville. There were other costumers on the shelves, including attempts by Halco and Imagineering, but Ben Cooper and Collegeville expertly tapped into what kids wanted by not only offering up the standard creeps and ghouls but by licensing cartoon characters, TV and movie personalities, and even characters from some of our favorite toy lines. If one company didn’t have the license for the latest popular characters, the other surely did. Even still, those without the official license would not be outdone and often provided a knockoff version of the year’s popular character. If you couldn’t find a Ben Cooper Batman, you could certainly go as Collegville’s, The Bat (not to be confused with The Bat from Ben Cooper’s Creature People line). 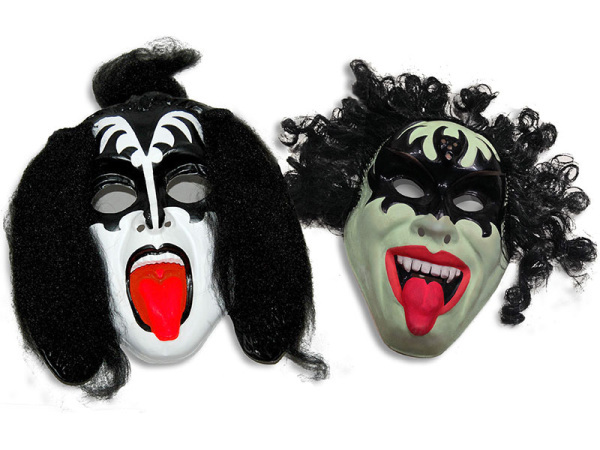 Similarly, if your local K-mart was out of Collegeville’s Gene Simmons from the rock group KISS, you might be able to find a close approximation from Ben Cooper. The colorful boxes were about as sturdy as a shirt box and featured a small cellophane viewing window that offering a glimpse at the vacuum formed mask within. 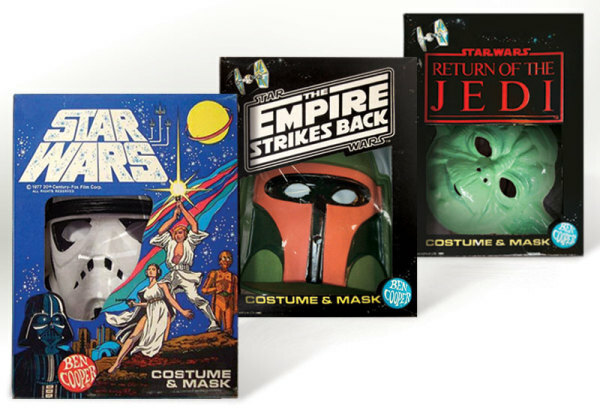 The costumes themselves weren’t much sturdier than the boxes they came in, and consisted of a brittle plastic mask, and a rayon or vinyl jumpsuit/smock. More often than not, the smock featured a picture and/or logo of the character it represented rather than the likeness of the character’s body. In effect we were all tiny walking advertisements. We weren’t being Skeletor, Mork, or Wonder Woman; we were just part of their street teams. Of course, wearing the name of your character on your chest spared us the embarrassment of explaining our costume to clueless adults. Gene Simmons vs Green Simmons? In hindsight, these costumes were mostly disappointing and very temporary. When not pinching or pulling out hairs, the elastic band that held the mask on often broke, the masks cracked, and the smocks tore. Most of this occurred before the big night. 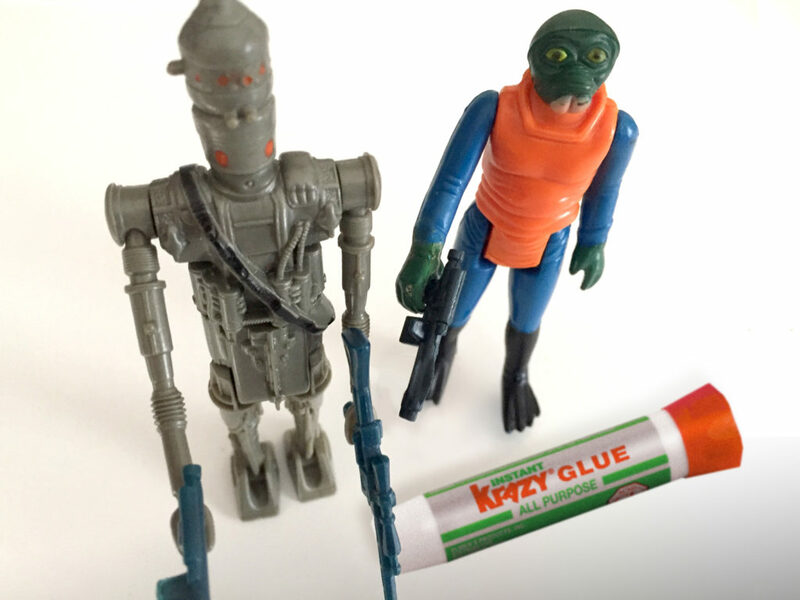 From my early days as the miscellaneous Hairy & Scary monster with the itchy rooted hair that wreathed my face, to the many Star Wars characters I’d dressed as year after year, I loved them all. 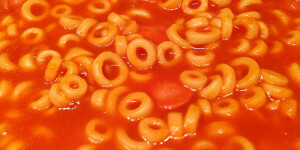 They were for Halloween what TV dinners were to dinner: Not all that great, but fun and convenient. I find myself browsing eBay and Etsy for Ben Cooper and Collegeville costumes, not just at Halloween, but all year-long. 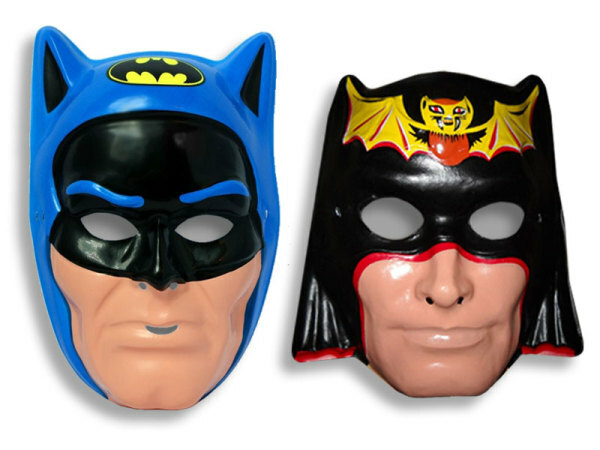 While I might not have had use for them when I was a kid, I find some of these costumes so alluring, that I fear for the safety of my wallet. 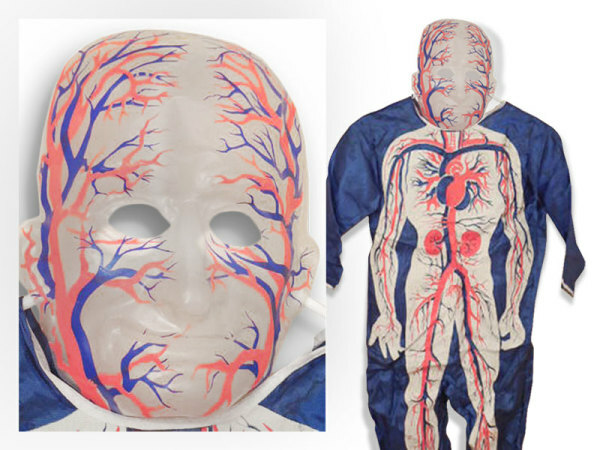 Here are some of my current favorites starting with the very rare Visible Man costume from Collegeville, which features a transparent mask adorned with the human circulatory system. Though it predates him by a decade, it reminds me of 1970s children’s TV personality and peppy health nut, Slim Goodbody. 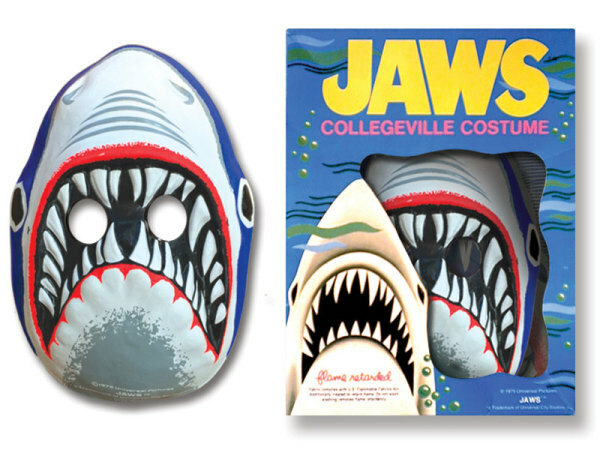 Another from Collegeville is this weird Jaws costume. I say weird, because, the mask and smock make it seem like you are actually dressing as the movie poster rather than the shark. As a Jaws aficionado, I would love this in my collection. The Ben Cooper Alien costume from the 1979 movie of the same name is also something to be admired. 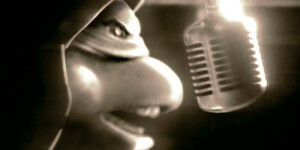 It features a partially transparent mask of the H.R. 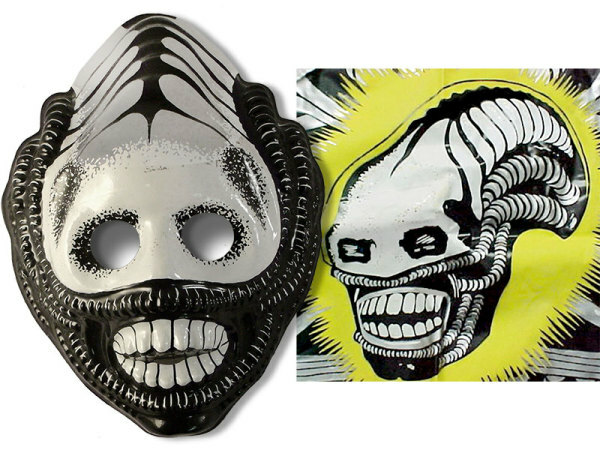 Giger designed xenomorph skull-face, and a smock featuring an illustrated side view of the creature in its phallic glory. Somewhat of a bizarre licensing choice, this one hardly seems child-appropriate considering the film’s R rating (though it does come in a child’s small). I imagine it was as popular as the Kenner Alien action figure among parents that year. Perhaps this was Ben Cooper’s way of one-upping Collegeville’s similarly inappropriate Incredible Melting Man costume. 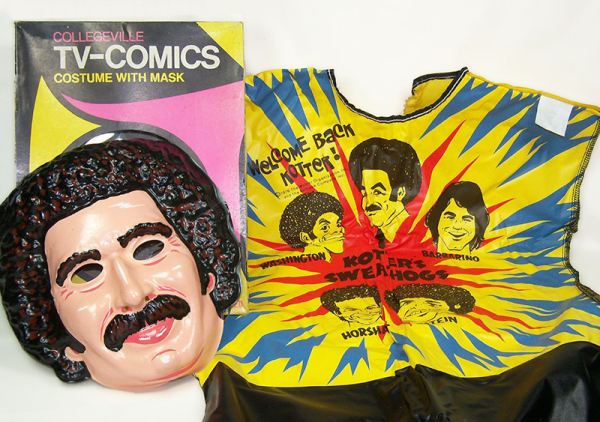 The Welcome Back Kotter, Gabe Kotter costume from Collegeville is another weirdo, that I absolutely love. Not for the design, but for the pangs I feel for the type of kid I’ve imagined picking it out. Sure, most kids would’ve picked Vinnie Barbarino, but this kid identified with Mr. Kotter and probably had his candy stolen as a result. Though I bet the brother and sister duos forced by their parents into the Donnie and Marie costumes probably didn’t fare any better. I’ve always loved the Cylon design from the original Battlestar Galactica. It’s a fusion of Darth Vader and his Stormtroopers into a bulky chrome badass. 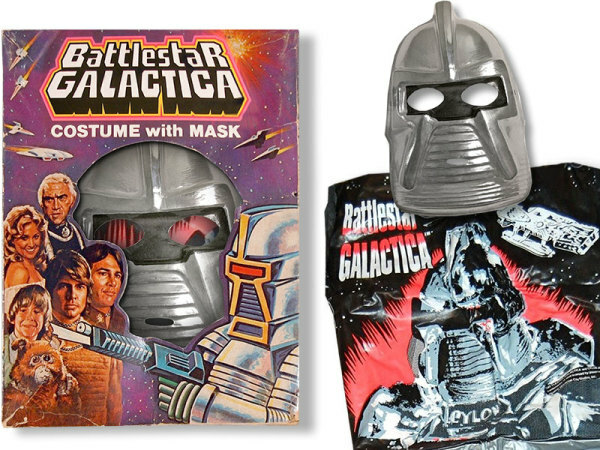 The Collegeville Cylon costume does a great job of capturing the look with the requisite metallic mask and smock printing. The box itself is also a work of art and features elements of the official Battlestar Galactica promo painting by John Solie, combined with a stunningly awkward illustration of a Cylon. Collegeville Cylon. By Your Command! 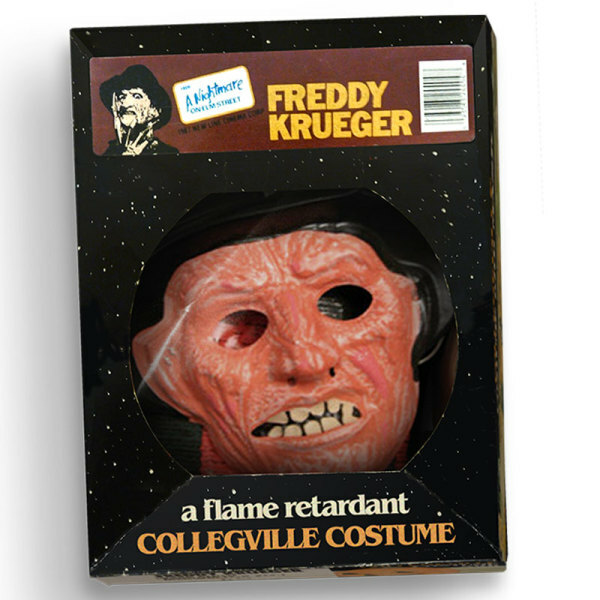 Another interesting licensing choice is the Nightmare on Elm Street, Freddy Krueger costume by Collegeville. Released in 1987, toward the tail end of the boxed costume era, this one takes the prize for most inappropriate. What parent wouldn’t want their kid dressing as a charred child molester on Halloween? Nonetheless, it speaks to the rampant popularity of the Nightmare on Elm Street movies in 1987. I’m surprised Ben Cooper didn’t try to outdo this one with a Blue Velvet, Frank Booth costume complete with gas mask. What makes this costume truly special is that the box cites it as flame retardant, a common practice for boxed costumes, but ironic in this case. Limited space, and high prices make it easier for me to enjoy these costumes from afar. Still, I long for a definitive archival book that documents them all. The colorful masks, delightfully lurid smock illustrations, and packaging design transcend their original purpose and stand as works of art. They also serve as tiny cellophane viewing windows into eras gone by. Certainly, this is worthy of a coffee-table book at the very least. The existence of such a book might sate my urge to buy every costume I find. Plaid Stallions continues a terrific service of posting old Ben Cooper, Inc. and Collegeville catalog scans. Terrence Towles Canote outlines the History of Ben Cooper, Inc. and its competitors on his blog, A Shroud of Thoughts. 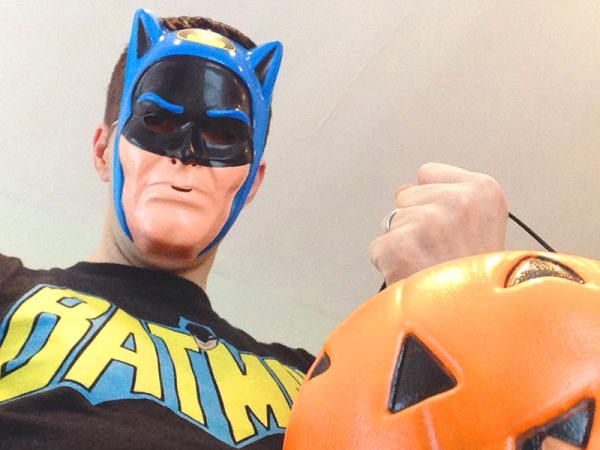 In an article for Slate, Charlie Moss writes about How Ben Cooper Changed Halloween Forever. A coffee table book of these would be great. Also, I should start dressing up as movie posters instead of characters. Why did this take so long to think of?